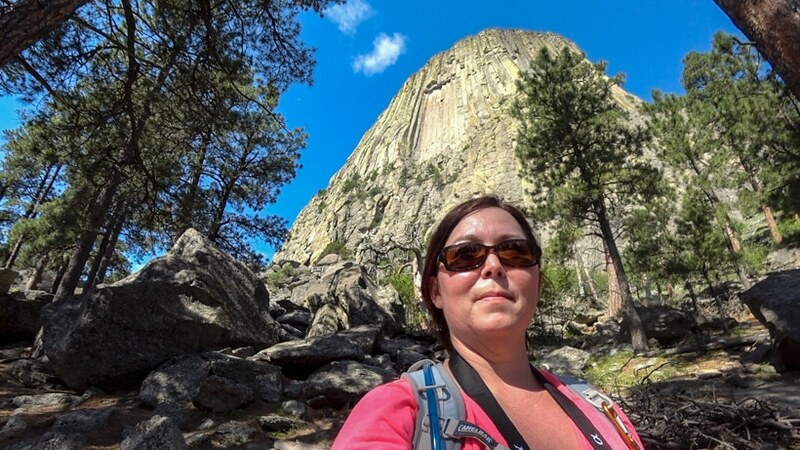 Hiking around Devils Tower was such a special moment – to witness not only the beauty of Devils Tower, but to experience the peacefulness of this sacred area. I just looked in awe and wonder at the brilliance of its creation and set out to explore more of its origin. Devils Tower sits all by itself with no other geological formations like it around. It's impressive when you see it from afar and even more impressive as you get closer to it. I woke up early so I could travel to Devils Tower and get there before the crowds and before I needed to start working. I also wanted to make sure there was parking for my RV, because as you know – that can be difficult. 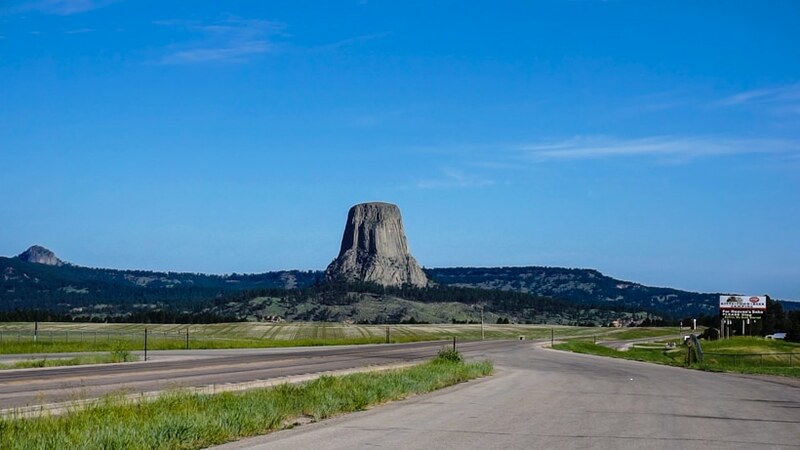 From a distance, as you travel the road just outside of the national park, you can see Devils Tower – standing all by itself and there are historical markers along the way to provide additional information about what you are seeing. I am really curious as to its origin and how the vertical formed columns of rock that make up Devils Tower were created. One of the historical markers puts its age at over 50 million years old. Can you imagine the life surrounding Devils Tower over the last 50 million years? What others have seen in centuries past? Here I stand. One person out of the last 50 million years gawking at its extreme and raw beauty. It's breathtaking. Though we still don't know exactly how Devils Tower formed – geologists believe that it formed from molten rock forced upward from underneath within the earth. It's vertical, furrowed columns were formed from the cooling of the magma and the further erosion to the walls creating the boulder fields beneath it. 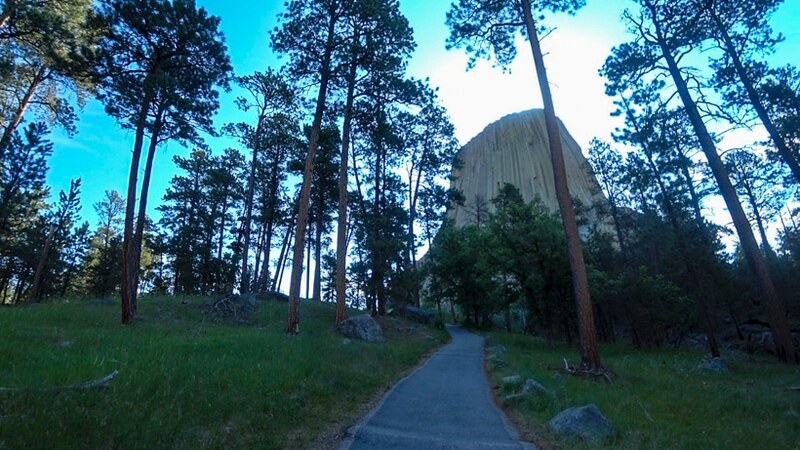 Devils Tower has been called many names over the years dating back to American Indian tribes. 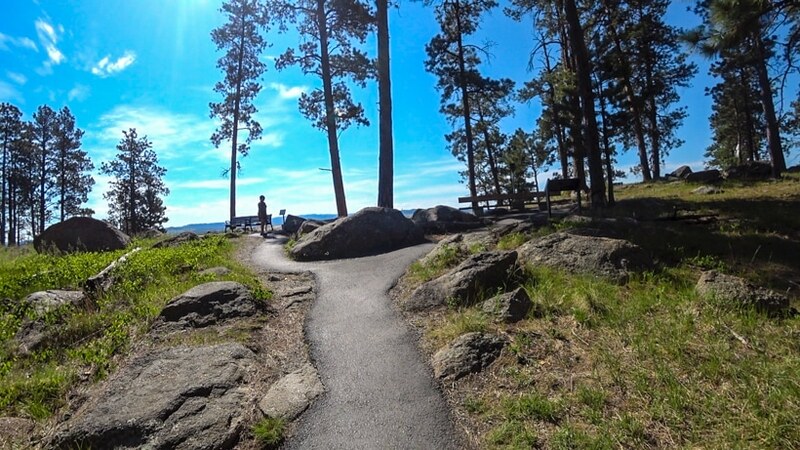 Early American settlers gave it the name Bear Lodge during the exploration of the Black Hills Mountains between 1855-1875 and if you look at maps during that time you'll see Bear Lodge instead of Devils Tower – its current name. Native American Indians have called it Gray Horn Butte, Tree Rock, and The Place Where Bears Live. 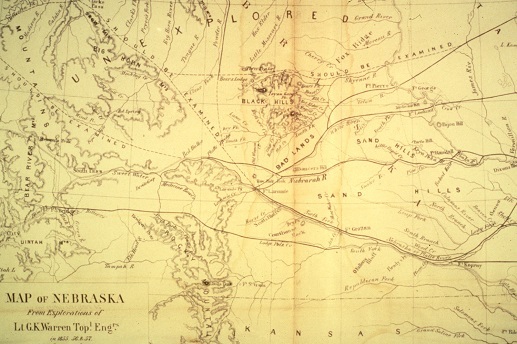 During the early 1900s a map maker, Henry Newton, conversed with Native American Indians about the name of the tower and he interpreted their name to be “bad gods tower”; however it is most likely that he misinterpreted as the area was known as a scared place and never thought of as evil or bad spirits. 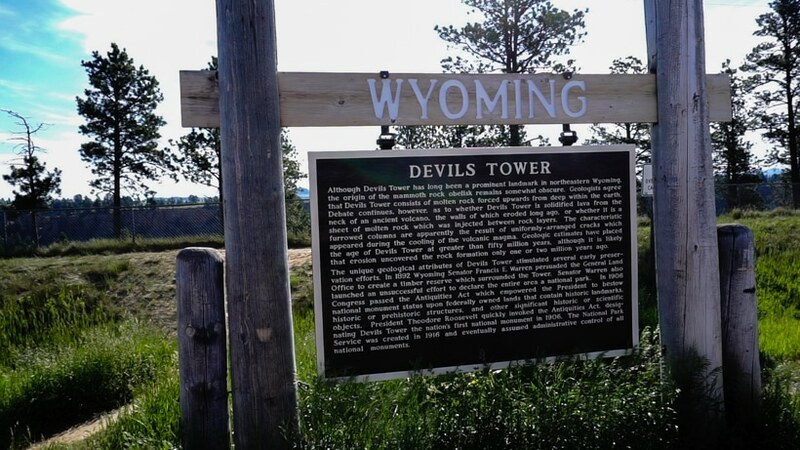 The belief is that he confused bear and bad; however the name stuck and it was officially named Devils Tower. As I pulled up to the front gates of the national park, just at the base of Devils Tower, I presented my America the Beautiful annual pass to enter for free. If you are traveling to more than 4 national parks each year, than it's worth purchasing the annual pass for $80 (at the time of this posting). There are discounted prices for annual passes if you are military, a senior citizen (62 years or older), and other designations. 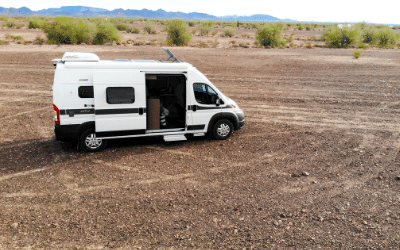 For full-time RV travelers, you'll definitely get your monies worth when traveling around the US to all of the national parks and monuments. Since I arrived early, I found a great parking space for Liz and one where I could maneuver easily after the crowds appear. I was also happy to be one of about 10 other hikers that day arriving early so I could really enjoy the peacefulness of the area and capture its beauty in video. Dogs are not allowed on the trails here so Lily stayed in the RV where I opened up the roof vents, turned on the fans, and opened a side window to get a breeze. Another great reason to get there early when you have pets so they are cool in the RV during the early morning hours before it gets hot outside. On my travels, I have given up doing some hikes were Lily wasn't allowed because it was too hot and I couldn't leave her in the RV without having to open up all the windows. For security, I wouldn't want to open all the windows and be away from the RV. It's just what you do when you have fur babies. 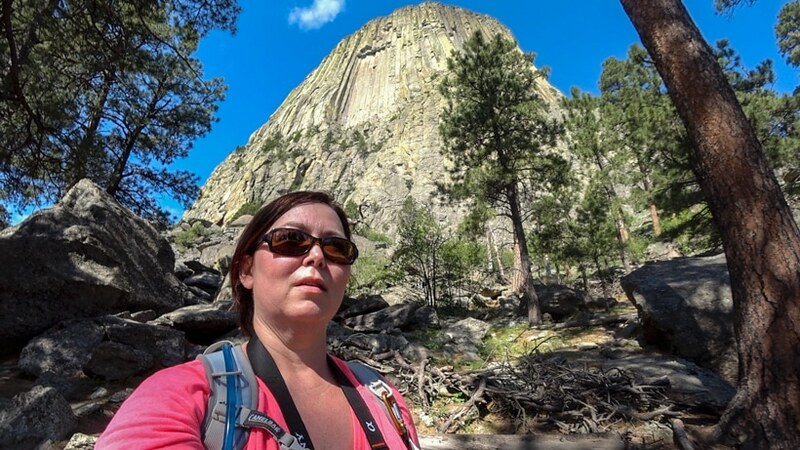 Before arriving at Devils Tower, I looked up on the National Park Service website the different hiking trails. 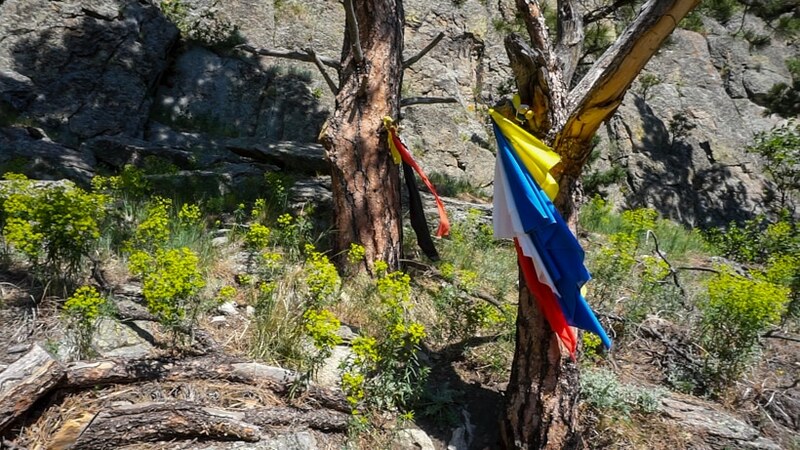 Each trail ranges from 1.3 miles to 2.8 miles. 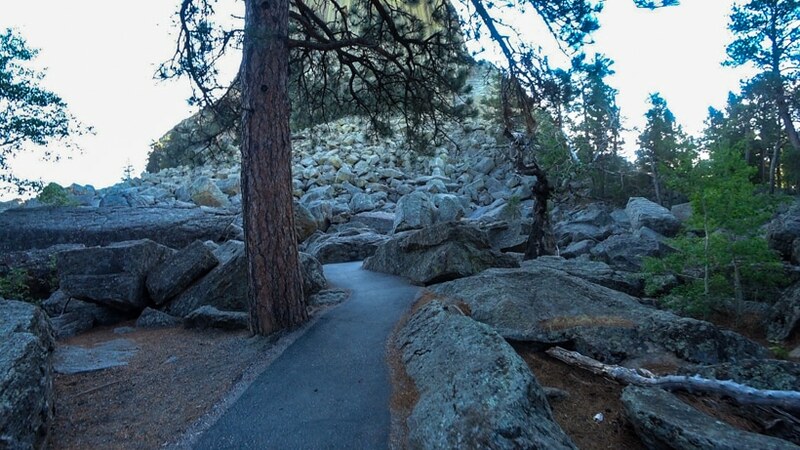 Tower Trail – 1.3 miles and one of the most popular trails that hugs the base of Devils Tower and provides history along the paved trail. Red Beds Trail – 2.8 miles with various steep grades around the Bella Fourche River valley. Joyner Ridge Trail – 1.5 miles that follows Joyner Ridge with some steep elevation changes, but a must for watching the sunset. Valley View Trail – .6 miles through the prairie dog town and then a 1.5 loop around the ampitheater. I decided to hike the Tower Trail to not only stay at the base, but learn more about the monument through historical markers. Instantly I was met with this fantastic view of Devils Tower. I marveled at the stillness of it all and the boulder fields below. When I was shooting video of it while walking the hiking trail, I was a bit speechless at times. It seemed strange to really speak too much, but instead just to witness the natural surroundings and life around the tower. Devils Tower is brimming with life from pine trees, deer, trees scarred from fire but still standing, and sacred prayer cloths dancing in the wind amongst the trees. Down in the Bella Fourche valley you can see the river and the life encircling Devils Tower. That's the best word I can say about Devils Tower. Okay, maybe awe-struck too. The views are incredible. I sat in silence on one of the boulders and just gazed up at the tower. I'm reminded how thankful I am to be here – to be on this quest – to RVing full-time around our great country. It's humbling. I'm constantly expressing my gratitude. I'm in love with my life. Devils Tower is on the Black Hills scenic route for my quest; however I had to divert from this route and only finished a portion of it before having to head North for cooler temperatures. In the next blog post and video – you'll see why. What are you doing to live daily and to accomplish your dreams? Leave me a comment below. RV Accessibility: Accessible for all RVs; however get there very early to get a prime parking spot. 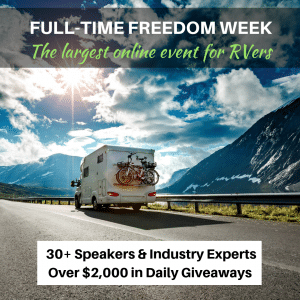 There's a limited amount of spaces for RVs 25 foot plus. Cell Phone Signal Strength: On Verizon I had 3-4 bars heading to the monument, but only 2 bars while hiking. Feiyu Tech Gimball – Stabilizer for Sony Action Camera to use mostly for walking to create less shakiness. 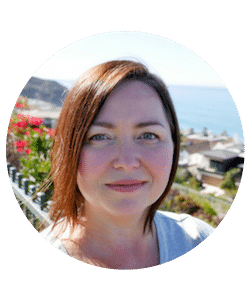 Hi Amber,I love reading your blogs. Peter and I want to take our rv on the road one of these times. Love to Lily. Hey there Bunny! So glad you made it over here to my blog and really glad we met in Lubec – along with Peter and his cigar. 🙂 When do you think you’ll be hitting the road and doing some more traveling? I’m sure we’ll run across paths again soon. I’ll be in Florida around Octoberish time and I’m not sure how long I’ll stay. Big hugs! 🙂 Well maybe one of these days you can travel over there and experience it too. So much to see isn’t there? What’s the one place in the US that you’ve always wanted to travel to? I just started reading all your blog posts (and can’t wait for the Aktiv portion). I noticed the city and state for this entry was Olympia WA instead of something like Hulett WY or Belle Fouche SD. Really enjoying your vlogs too! Thanks so much Susan for your feedback. I only have the video for now on the van tour (Video: https://youtu.be/U3Td4GGlHtw) but will soon have a post up. I usually don’t do a post later than the video, but things have been crazy here. More to come on timing. lol. Oh I looked into the error you mentioned. I can’t seem to reproduce it. I wonder if it’s kind of the weird way the map works in that if you hover over a dot it shows the blog post, but then it’s hard to move your cursor to the right of that blog post pop-up. I might need to change that. Thank you for letting me know. Hello! I just discovered you today. 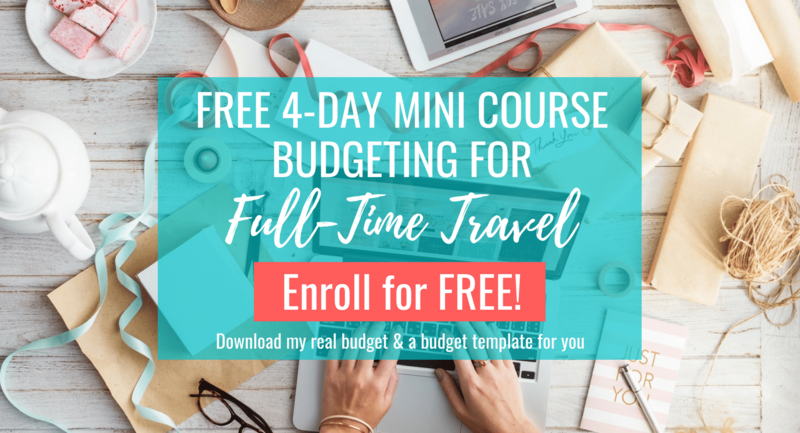 I’ll do some binging on your blog and on your YouTube channel. What I did today to chase my dream is to continue to educate myself on what life is like for a single woman RVing. I’m going to take a few weekend trips out to test the waters. I live in Colorado and there are plenty of places to check out. I will be car-camping until I sell my business or, even trade it for a Class B or C rig. So, I have some goals here. In the meantime, I’m studying as much as I can before I even get out the door. 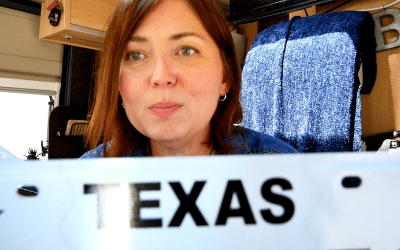 Kimberly – You’re so welcome and have such a great attitude on researching and educating to find out more on RVing. Good for you for taking that first step. 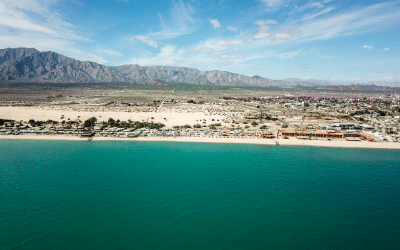 Have you taken any of those weekend trips yet?